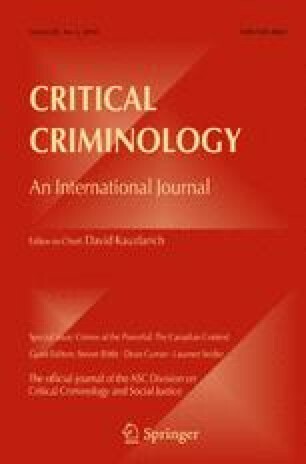 This article draws upon a number of concepts from contemporary criminological theory to address bullying and violence in the workplace. Utilizing empirical data from the UK service economy, the article argues that workplace violence includes verbal and emotional abuse and bullying. Management bullying, workplace cliques and the retail practice of “stealing sales” within the organizational and political-economic context of competition, profitability and targets reflect cultural manifestations of economic imperatives and subjective motivations that can lead to harmful and problematic practice. In considering this evidence from an ultra-realist perspective, the article suggests that some subjects, libidinally invested in the corporate workplace’s symbolic order, believe themselves to possess the “special liberty” to rise above normative codes and rules, as well as ethical obligations, in order to maximize self-interest through harmful actions that have negative consequences for co-workers. The workplace “bailiff” reflects the complex interplay between culture, political economy and subjective motivation to act in harmful ways within the workplace. This study was approved by my host institution’s Research Ethics Committee and conducted in compliance with the British Society of Criminology’s statement on ethical practice.